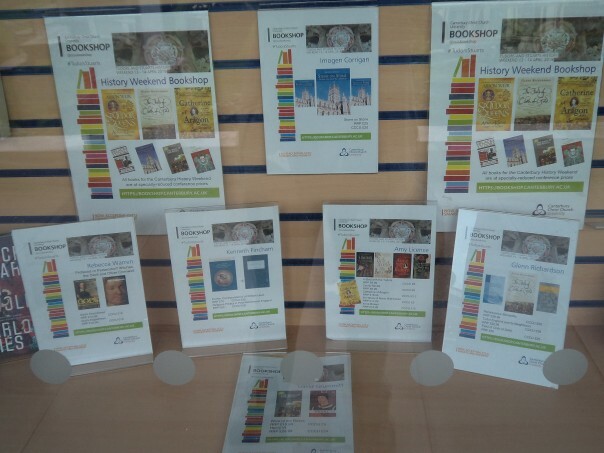 Consequently, the end of the year will bring treats for those interested in medieval history because Professor Michael Wood will be coming to speak at Canterbury Christ Church (at Augustine House) on ‘Why the Anglo-Saxons matter’ on Tuesday 30 October. As many of you may know, Michael is a historian and filmmaker. He is author of many best-selling books and well over 100 documentary films, among them The Story of England, “the most innovative history series ever on TV” (The Independent.) He recently received the British Academy President’s Medal for outreach in History and is Professor of Public History at the University of Manchester. This lecture coincides with a new exhibition on the Anglo-Saxon kingdoms at the British Library. Furthermore, the Centre is teaming up with Kent Archaeological Society to hold a one-day conference on various Kentish names. As ever this will feature Dr Paul Cullen, the well-known expert on Kentish place and surnames, but also speakers from the Centre, from the University of Nottingham and the British Museum. Again, for details see the Centre’s webpage on ‘Future Events’ and tickets will go on sale in early September. If you have any difficulties with the online booking system, please contact Ruth Duckworth at the box office ( artsandculture@canterbury.ac.uk or 01227 782994). 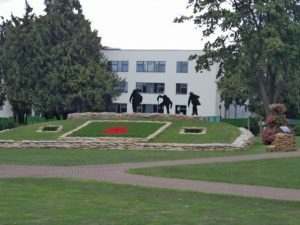 Ashford Memorial Gardens – WWI commemoration. Going up soon on the ‘Future Events’ will be the Centre’s contribution to marking the centenary of the ending of World War I. Dr Martin Watts is organising a series of events with colleagues across the Faculty of Arts and Humanities. The programme for Friday 9 November will be available shortly and as soon as it is I’ll let you know. In terms of virtual rather than concrete ‘events’, Dr Diane Heath met Cressida Williams, the manager at Canterbury Cathedral Archives & Library, this week regarding the schedule for the ‘Picture this…’ series of short research pieces of items from the archives and library. 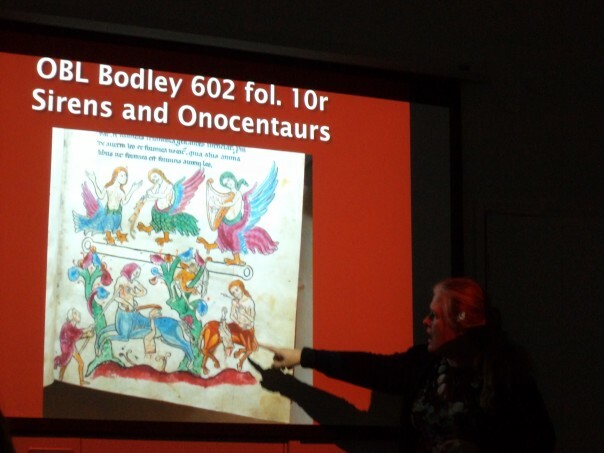 This is a popular monthly contribution that allows postgraduates from Canterbury Christ Church and the University of Kent, as well as other researchers, to explore a particular image from a document, manuscript or book. 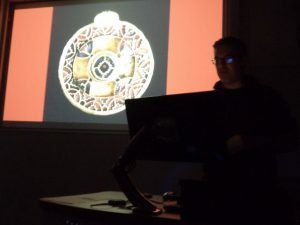 Until recently, Diane was organising this with Dr Stuart Palmer, but it is great to hear that he has just got a post as a history lecturer at UEA in Norwich. Thus, there is plenty of news this week, but I thought I might just mention my research trip to St Mary the Virgin parish church in Ashford last Saturday in search of a certain misericord. As some of you may know this church is extremely interesting for historians working on several periods of history because of the many changes and interventions that have occurred over the centuries. However, I cannot cover everything here; that is from its pre-Conquest foundation to the removal of the Victorian pews in 2011 to turn the nave into a community space as well as a place for services, and instead I’ll stick to the late Middle Ages, with a little from the 17th century. The 15th century saw considerable changes because Sir John Fogge, who held the local manors of Little and Great Repton among other lands, established a college of priests at the church. This involved some rebuilding and rearranging of the church, including the creation of stalls in the choir. 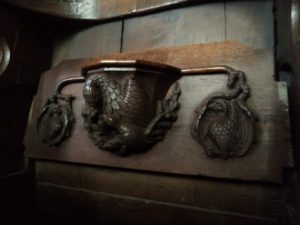 Interestingly, there are two stalls that face east and it is these which have the most richly carved misericords: ‘the pelican in its piety’ (shown here) and the one I was looking for ‘pigs feeding on acorns’. As you might expect from such a founder, his once elaborate tomb is positioned close to the high altar, and, even though much of the monumental brass on the table-top tomb has now gone, there are still 2 carved images on the west end, including St Christopher, and on the north side there is a Latin inscription detailing the improvements he had commissioned. According to the guide book, there was once a large painted wooden canopy above, and even though it survived the Commonwealth period it was taken down in 1697 when a massive new wooden altar-piece was installed. If you want to know more about Sir John Fogge and his college, and we are fortunate that his will survives among the PCC wills, Dr Gillian Draper will be publishing an article entitled ‘Sir John Fogge, c.1417-1460, Rebuilder of St Mary’s Ashford’, in the KAS journal Archaeologia Cantiana next year. 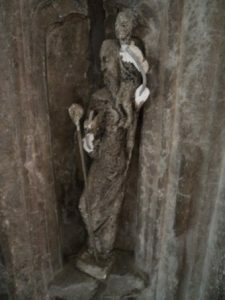 Very briefly keeping with Ashford wills, there are some interesting bequests that shed light on the late medieval church, including Alice Igo’s reference to the church as ‘Our Lady of Ashford’, which suggests an especially well-known image of St Mary as the patronal saint. Alice, in 1503, wished to be buried beside the holy-water stoppe in the church porch. The church also had a Jesus altar (in the Jesus chancel or aisle), with a figure of Jesus before which Richard Bacon (1479) wished to be buried and to which he left 12d. Interestingly, the rood-loft extended across the north and south aisles, as well as the central choir, something that required new work in the early 1470s because William White left 20s towards the work in the two aisles. For the holy family, there were images and altars to Our Lady of Pity and St Anne, which were remembered by numerous parishioners. Moreover, the church was very busy – there were at least 18 other saints, including St Thomas of Canterbury, and Joan Poleyne was one of several who left money to St Thomas’ light. The church also had an Easter Sepulchre, which may have been the Fogge table-top tomb, and in 1493 Thomas Wilmott the vicar bequeathed the large sum of 6s 8d to the light there. In addition to this tomb, there are 3 remarkable funeral monuments in the south transept of members of the Smythe family, beginning with Thomas or ‘Customer Smythe’, so named from his post as Elizabeth I’s custom’s officer of the south east ports from which he made a very great fortune. The others belong to 2 of his sons, Sir John the eldest and Thomas his fourth son. Although in broad terms there are considerable similarities between all 3 monuments, the positioning and dress of the principal figures, their wives and children differ, ranging from the recumbent figures of ‘Customer Smythe’ and his wife with their 12 children, Thomas dressed as a merchant, to Richard Smythe in armour lying prone and his older brother, also in armour but kneeling like his wife, who has her hand on a skull – reminder of mortality. Keeping with the early 17th century, as well as some carved woodwork a gallery was constructed on the northern side of the nave with a second on the same side about twenty years later. 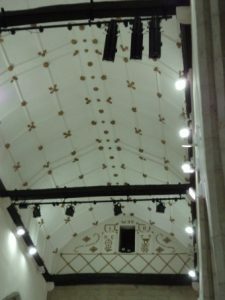 Even though these no longer survive, being sacrificed when a southern gallery was built and the northern one reconstructed to match it, nave does still have a splendid Laudian plaster ceiling. Again, according to the guide book, in the past it has been painted in different colours, was whitewashed for a time, painted brown to look like wood, and is now, as you can see, cream with gold bosses. I hope I have tempted some of you to visit Ashford because for most it is just a railway station on the way to and from London and the Kent coast. And for next week, I’m joining Dr David Grummitt at the Fifteenth Century Conference at the University of Reading. Hopefully, I will also have news of Dr Diane Heath who will be heading to Oxford soon for a conference on ‘Inner Lives’ and Professor Louise Wilkinson, who has been very busy writing her latest book on aristocratic women in the High Middle Ages.